Forest harvest and impacts on stream heating – Zion Klos, Ph.D.
Klos, Z., D. Boyes, T. Link (). Quantifying Radiative Inputs to Headwater Streams in Recently Harvested Forests. Removal of streamside forest canopy during timber harvest can lead to large increases in the amount of shortwave (solar) radiation reaching the stream surface. Shortwave radiation increases may be partially offset by longwave (thermal) radiation decreases due to the decrease of the vegetation canopy. Rapid recovery of herbaceous streamside vegetation in recently harvested areas may act to negate the increased shortwave radiative inputs caused by tree canopy reduction. A quantifiable difference in the radiative inputs affecting streams was found by measurement of incoming shortwave and longwave radiation. Arrays of 10 shortwave and 2 longwave radiation sensors were installed in first-order stream systems for 24-hour periods of high radiation loading to quantify the contribution of incoming solar and thermal radiation in headwater systems. Sensors were installed in non-impacted forested reaches, a partial cut reach (~50% canopy removal), densely vegetated and sparsely vegetated 5 year-old clearcut reaches, and a simulated freshly cut (absent of any streamside vegetation). A significant difference in the regrowth pattern of riparian herbaceous vegetation cover between clear cut 1 and clear cut 2 streams, resulting in different radiative regimes, was found. Additional data were collected in June 2011 to further understand the effect of riparian vegetation shading on stream temperature. Species richness and species abundance were calculated using four randomly selected quadrats along both Clear Cut 1 and Clear Cut 2 streams streams. Longitudinal and cross-sectional profiles were also created using a Total Station surveying device. A soil auger was used to create a soil depth profile based on texture, as well as gather soil moisture data at different depths. Additionally, electrical resistivity tomography (ERT) was used to image subsurface soil moisture (using electrical resistivity measurements), as well as other catchment-scale geomorphologic features, such as large boulders, and bedrock. Results indicate that thermal radiation is the dominant source of radiation in all treatment reaches. All-wave incoming radiation was reduced by 36 to 39% in the undisturbed reaches, compared to open areas. The partial cut area and heavily vegetated 5-year old clearcut were very similar to intact forested reaches, with 37% and 38% all-wave reduction relative to open areas. The sparsely vegetated 5-year old clearcut exhibited a 16% reduction in all-wave radiation, and the simulated fresh clearcut exhibited a 9% reduction, relative to open areas, due to shading by overhanging banks. Results from this study indicate that some recently clearcut headwater streams are able to recover to pre-harvest shading characteristics if adequate regrowth of herbaceous vegetation occurs. Additionally, secondary research comparing the topography and subsurface soil moisture profile of the two clear-cut streams suggests that stream channel bedrock, shape, and other topographical features play an essential role in determining the character and extent of herbaceous vegetation. 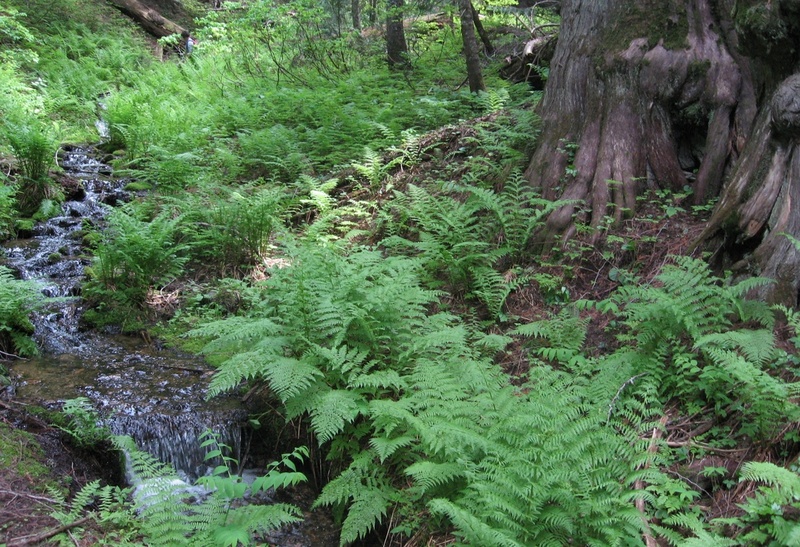 The results of this study clearly illustrate the need for forest harvesting practices that are based on headwater stream physical characteristics that influence the establishment of herbaceous vegetation following harvesting events.